Piscis Austrinus. © 2003 Torsten Bronger. Piscis Austrinus (abbreviation: PsA), the Southern Fish (also known as Pisces Australis), is a small constellation of the southern hemisphere that lies west of Sculptor and south of Aquarius. 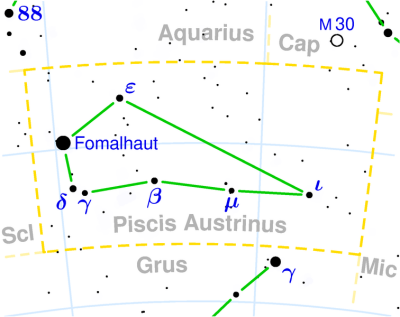 By far its brightest star (the only one brighter than magnitude 4.0) is Alpha PsA, or Fomalhaut.